The legal event that was a “no-brainer” for all small to medium law firms to attend this year has just passed – here are some of the highlights I picked up from the seminar. I always like to sum up the event and share an overall vibe/message/trend/gold nugget that was common throughout the event. My take-home from the Boot Camp was that the small law firms are in a very exciting period with many opportunities on the horizon, and these far outweigh the negative doom and gloom painted by so many practitioners. Anton Theron from the Gauteng Law Council opened the event complimenting the high attendance and also highlighted the fact that 80% of law firms in Gauteng are small law firms with one or two practitioners. Just before the closing of the event, he asked the audience if they wanted another event that focused on the Legal Practice Act, most of the audience raised their hands. So, keep an eye on events coming up from the Gauteng Law Council over the next few months. David Lancaster in his talk “The Small Law Firm in RSA – What is the future and how to prosper?” gave a very positive outlook on the future of small law firms in South Africa and that “Disaggregation” of law services from corporate and corporate council has opened the doors for smaller niche firms to get work which was before given to their “all in one” panel law firm. Using networking with other niche market firms, where you can add services which they do not, is another clever way to widen your clientele net. David’s presentation set the tone for the rest of the seminar, and basically the underlying message that small law firms have great opportunities in the next few months to grow their business. Know which market you are going to target, including location. Advocate John Mullins SC and Paul du Plessis discussed and gave solid hands-on tips on medical malpractice in their joint presentation “Medical Malpractice Today”. Paul’s part of the session was packed with plenty of practical tips, focused on his ROP (Retinopathy Of Prematurity) medical malpractice firm – not only were the practical tips valuable, but his stories on how they improved the lives of children and families, was heart-warming. When pricing a matter, look at the entire case, the time needed and don’t forget to remove VAT – often what looks like a lot of money now, after 3 or 4 years, experts and research costs, it will end up negative for you and the client. They spoke well together, very relaxed and both very knowledgeable. So much so, they should consider doing “stand-up” together. 😉 A well-presented and interesting presentation – not a slide in sight, but their information was compelling enough to keep everyone zoned in. 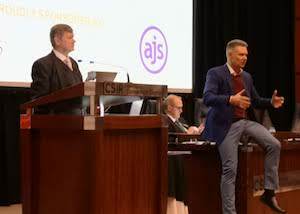 Johan van Staden briefed the audience on the Compliance Obligations for Attorneys on the Financial Intelligence Centre Amendment Act of 2017. Johan scared everyone with the size of fines for not complying with the Act, and also highlighted a couple of real life examples that currently exist and should be looked into. For example, a conveyancing matter where a salaried government employee managed to buy an R8.5Million home, and the conveyancer failed to report the transaction. He highlighted the 7 pillars of compliance, duties of directors and senior management, risk management and compliance programme, different types of entities to report on, risk rating, risk assessment, risk factors, risk treatment and due diligence to follow with clients. He also offered delegates a Risk Register created in MS Excel. Krish Govender gave a very informative report on the creation of the Legal Practice Act, how it intends to serve the public and how far down the line we are with the Legal Practice Act. Many challenges and changes lie ahead for the profession, in essence the focus of the act is about protecting the public and delivering a more accessible legal service to everyone. He covered the formation and challenges of the National Legal Forum, the Ombud and the handling of fees – to mention a few. The “Case Law Research” presented by Louis Podbielski of LexisNexis touched on practical tips on how to speed up and improve your research with the products available. The Citator Visualizor which is pending release, will have some effective assisting tools to help highlight relevant topics even more. Any question on case law at LexisNexis can be directed to caselaw@lexisnexis.co.za. An interesting presentation by International speaker Ned Daze looked at the area of “Outsourcing – Smaller Investment, Bigger Results” – he spoke of his experience at Rosen Institute and how they improved efficiencies through outsourcing. The work is done cheaper and faster than you could do it. Ned also mentioned when looking for outsourcing partners, do not limit your selection criteria to legal service suppliers, open it up to all service providers. Also, when compiling your procedure manuals for outsourcing agents, make sure you assume they have zero knowledge, otherwise the assumption of their understanding may get you a solution you don’t want. Not so much outsourcing, but an excellent gold nugget from Ned, was that every law firm should have an independent company analyse their website. Not somebody competing for your website business, but somebody who will give you an unbiased opinion. Often what you think is really cool and catchy, may turn out to be confusing to those who don’t know your firm or background. When outsourcing, give the contractors 1 (one) decision maker, otherwise you waste their time and your money with them bouncing between people for a decision. “Innovate from what you already have”, was the take-away I took from Chris Pearson’s talk – “Practical Business Advice to Lawyers”. Chris is from the practice management software solution provider AJS. Chris gave us a stark reminder on how technology has progressed, and with a number of products or services we think are pipe dreams, but which are already being used today. Touching on the speed at which South African law firms adopt new technology and handle innovation, he said innovation in our legal market is an evolution, with slow but steady progress, unlike 1st world countries, where it is more of a revolution, at quite a rapid pace. Always listen to your clients. Anton Theron closed the seminar and thanked all delegates and sponsors for the successful event. It is not often you see people scribbling notes madly to keep up with the presenters at seminars, but I noticed it throughout this seminar – which goes to show how effective and informative this seminar was to the 300 plus delegates. I have no doubt the events to come from the Gauteng Law Council and sponsors AJS and LexisNexis will be packed to the rafters. Make sure you book early for future events. Thanks to the two main sponsors of the event, LexisNexis and AJS.